"This study can conclude that medical cannabis patients report successfully using cannabis along with or as a substitute for opioid-based pain medication," the team reported in the journal Cannabis and Cannabinoid Research. 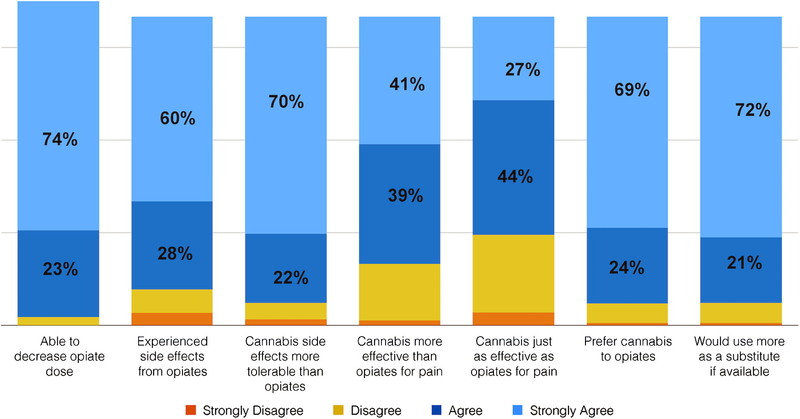 "Patients in this study who are using cannabis and opioids report that they are able to use less opioids and that cannabis presents less unwanted side effects than their opioid-based medication." Of that group, "97 percent of the sample 'strongly agreed/agreed' that they are able to decrease the amount of opioids they consume when they also use cannabis. In addition, 89 percent 'strongly agreed/agreed' that taking opioids produces unwanted side effects such as constipation and nausea," the researchers wrote. But interestingly, the researchers also found that "81 percent 'strongly agreed/agreed' that taking cannabis by itself was more effective at treating their condition than taking cannabis with opioids". "Prescription drug overdoses are the leading cause of accidental death in the United States. Alternatives to opioids for the treatment of pain are necessary to address this issue," the researchers write. Although marijuana is far from a perfect solution, there has been no recorded overdoses from marijuana – and this study has shown that the patients themselves rate the drug highly for pain management. Plus, it gives scientists even more of a reason to find out how marijuana affects people over longer periods, and how harm could be minimised in the future.